Looking north from the San Joaquin River which borders Mono Hot Springs California is the mountain range called the Silver Divide. 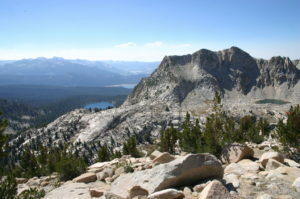 The highest peak is called the Graveyard Peak at 11,494 feet. Along that range you will notice a huge concave section. This geographic location was formed millions of years ago when these mountains were young. 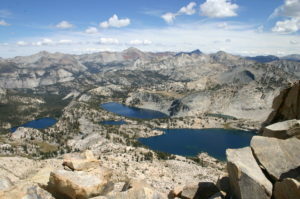 Located directly below at 9,167 feet, sniggled into this natural setting is Devils Bathtub. 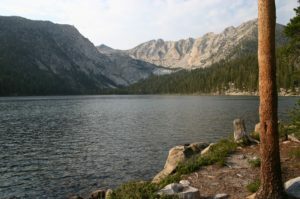 This eight mile round trip trail starts west of Edison Lake next to the Cunningham High Sierra Pack Station. Keep in mind this is a strenuous hike, carry water and a topo map even though this trail is easy to follow. There are signs at the two major trail junctions. When approaching the first split continue hiking straight and on the second junction bear to the left. Wile ascending the trail will cross Devils Bathtub run-off stream several times. Your map will call this stream Cold Creek. Next are the switch backs that lead to Devils Bathtub. As you increase in elevation, splits in this thick forest foliage will introduce distance views of Edison Lake. Along the trail is a section marker with the inscription; EAT1969. This marker identifies the range and township Junction lines to coordinate locations on area maps. Allow two to three hours of hiking to reach the lake. Once you arrive, to the east of the run-off stream are flat areas ideal for over-night camping. Staring across the lake is its identification marker, a granite rock protruding through its surface. If you decide to stay over-night the canyon behind this lake offers an ideal cross-country adventure. There is a slightly used trail along the east shore line. When you arrive at the far end of this lake a natural sand bar follows the shoreline. If you are on a day hike, at this point you should make preparations to start your 90 minute journey back to the trailhead. Let’s presume you decided to spend the night and in the morning to start exploring this remote box canyon. Elevation increases as you follow the inlet stream. There are no trails but stay within the canyon walls as it ventures west leading to a huge tarn (wet area of melted snow). This large box canyon can offer other options; if you prefer climbing, to the south the canyon wall is a challenge to preview the distant views of the previous valley following west to the Minaret Mountains. If you plan another night with full camping gear, hike the class 2 and class 3 north ridge as it continues in elevation east. There are two hidden ponds along this high ridge for camping. The larger of the two ponds had a great camping location with tall rock walls to block the cold winds that materialize after sunset. I experimented four years ago and tried to locate another route to Peter Pande, Olive and Ann Lakes. I found a possible route but was a little too steep to descend with a 45 pound full pack. From this elevation I could see the three lakes that were my first adventure from another route into this wilderness decades ago. Also from this location looking south I could see the tarn located in the box canyon, Devils Bathtub, Edison and Florence Lakes. Just the view alone was worth the gamble searching for that mystery loupe. Decades ago my first solo hike to Devils Bathtub turned out to be a memorable adventure. I departed from the Edison Lake Trailhead late morning. With youth on my side I arrived at the lake under 2 hours. With daylight also in my favor I decided to hike around the lakes west side, (which I do not recommend). The east side is much easier with less bolder hopping. When I arrived at the sand bar I decided to relax and laid down on the warm sand. I must have been very tired because when I awoke shadows were starting to form over the lake and I only had my day pack. Looking at the angle of the sun, I thought to myself; can I hike over 4 miles back to the trailhead before dark? Lucky I always carry a flashlight, it was needed for the last mile. The lesson learned from this hike; always be aware of your surroundings and be prepared for any unexpected changes. Almost a decade pasted before I returned to search that box canyon behind Devils Bathtub. One day I will return and look for that loupe that drops down to Peter Pande, Olive and Ann Lakes.